Nonprofits and health insurance companies rarely reveal their marketing strategies. But Enroll America—a nonprofit involving a coalition of groups supportive of the Affordable Care Act—has given Adweek an interesting, results-based look at how marketers in this sector are leveraging digital to find specific groups of interested consumers. Enroll America ran a mobile ad campaign while working with Qriously from February 25 to May 31. The promos ran within Qriously’s network of apps and in other mobile ad networks—including MoPub, Nexage and Rubicon—that Qriously is plugged into. The mobile ad tech player claims to reach 150 million people in the United States. Creative on banner ads asked, "Why do you not have health insurance?" Consumers could then answer the question by clicking on "cost," "complicated" or "lack info" buttons. Out of the campaign’s 53,327 consumers who answered, 35 percent picked "cost," 32.4 percent chose "complicated" and 32.6 percent clicked on a "lack info" button. And, 40 percent of the consumers who answered the question clicked through to Enroll America’s website to learn more about health care options. "They’re delivering ads only to people who don’t have health insurance, and one of advertising’s biggest challenges is making sure that you’re presenting your message to the right people," said Joe Zahtila, North American general manager at Qriously. This information was then used to serve the interested consumers one targeted ad for Enroll America per day for the remaining length of the campaign. The idea was that the initial clicks on the ads represented qualified leads for Enroll America because, theoretically, only people without health insurance would answer the questions. Over three months, 2,827,920 impressions were served to this group. 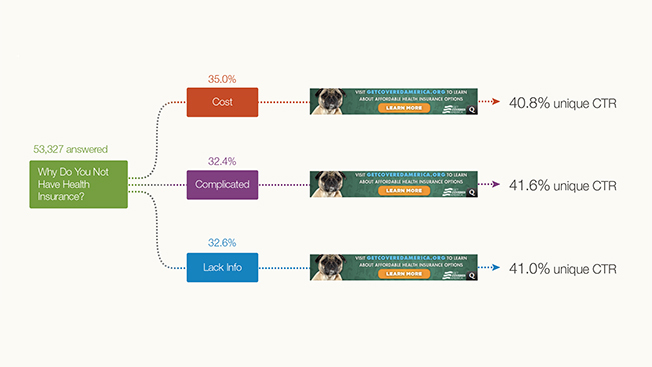 The re-targeted ads had a 1.47 percent click-through rate, generating 41,554 more clicks. "We knew the people we were getting were absolutely interested in the campaign," said Enroll America’s Martine Apodaca, director of marketing and corporate partnerships. Enroll America declined to share the number of healthcare sign-ups from the campaign. But, the company did run a survey with 351 of the consumers who saw the ads to measure its effectiveness. Twenty-six percent of the consumers surveyed said that they would apply for health insurance after seeing the ad compared to 18 percent of a control group that said the same. The best part of Enroll America’s campaign? It was pro bono. Enroll America worked with The Ad Council and Mindshare on the campaign to create a media plan to raise awareness around health insurance. The Ad Council works with agencies and media companies to secure inventory donations for nonprofit organizations. The Ad Council brought in more than $1.5 billion in donated media during 2013. Mobile, in particular, was singled out as a tactic during the media-planning process to help Enroll America hit a specific target, according to Beth Ellard, executive vice president of media at The Ad Council. "One of the reasons why mobile was so important was because the target audience for the campaign were low-income women aged 18-34 years old, both general audience and Hispanic," Ellard said. "In particular, these two audience segments live on their phones."